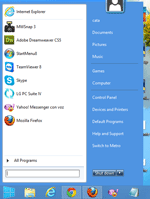 a computer program that allows users to organize applications and icons. a computer program that allows users to organize and manage applications. a computer program that allows users to have a start menu in Windows 8.
a dock, a feature interface that allows users to start, change and control various applications. Softfree.eu is not responsible for how you will use the information from this description, or how you will be using this program. Softfree.eu informs that IObit Start Menu 8 should be used in compliance with laws and intellectual property rules and the current Penal Code. We leave it to your discretion to determine whether this product or how you plan to use is legal. Do not approve or encourage in any way the use of any software in contravention with the laws in force. The purpose and intent of the site Softfree.eu are limited only to provide information to users and nothing else.